And as they say--another one bites the dust. The 2015 Canal Music Fest was held on June 13, 2015 and despite nearly 90° temperatures and a brief but steady period of rain, this was our most successful event to date! Over 3,500 people joined us as Almost Queen rocked the park! We would like to thank ALL of you and Almost Queen for another awesome Canal Music Fest! And as promised—we had a good time, good time! 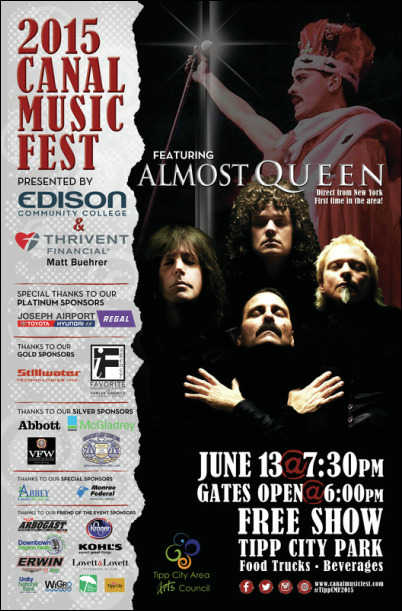 Find out more about Almost Queen on their website and then jump over to Facebook and click "LIKE"! All photos and videos courtesy of Almost Queen and "shout out" to Randy Gregg for all you do! ©2019 Canal Music Fest c/o Tipp City Area Arts Council, Inc.
​The Tipp City Area Arts Council is a 501(c)3 nonprofit organization.